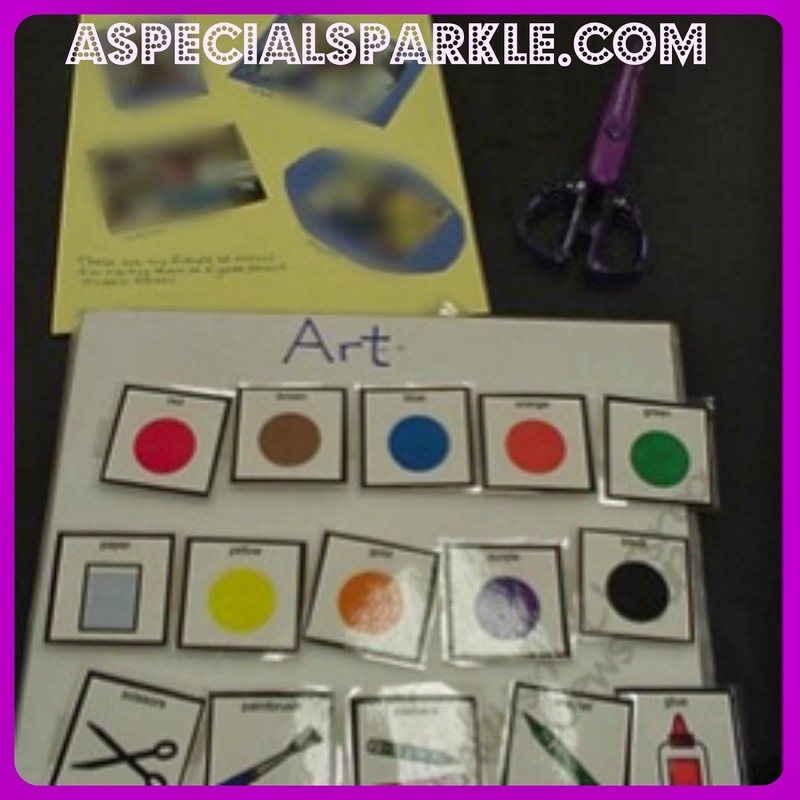 When you go to school to become a special education teacher, you learn so much about the laws, IEP's, teaching reading, and generally ways to accommodate students with special needs. There is one slight problem with this system. Teachers are rarely taught specific strategies for specific disabilities. With a change in schools, my students are now a mix of high functioning Autism Spectrum Disorder and students with dyslexia. Having a strong background in ASD, I've spent this year focusing on my skills for teaching with dyslexia in mind. It's made me realize just how little I was taught about dyslexia in my teacher training. I'd like to take some time to show you the things that have helped me to most when teaching kids with dyslexia. 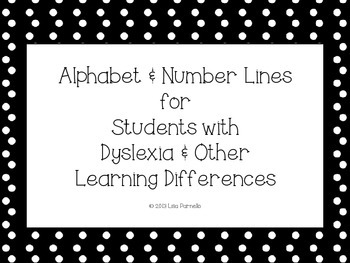 People often think of mixing b and d as a sign of dyslexia, but it's so much more than that. It's mixing p, q, g too. It's making 5's and 3's backward. It's writing "51" instead of "15" on a math test. It's writing a completely wrong sight word, but spelling it perfectly. It's switching one sight word for another when reading a story such as "on" for "or." It's all in the brain! Did you know kids with dyslexia use the right side of their brain to read? Typically developing brains use the front and back of the left brain when reading. People with dyslexia use the front of the left brain, but not the back. They compensate by using the right side of the brain. The often see words as shapes or ideas. They may switch "house" for "home" because they mean the same thing and start with the same initial letters. Kids with dyslexia are often very visual learners. Some of my most severely dyslexic kids are the most artistic! Their drawings are unbelievable! Plus this makes it easier for them to memorize things by sight. 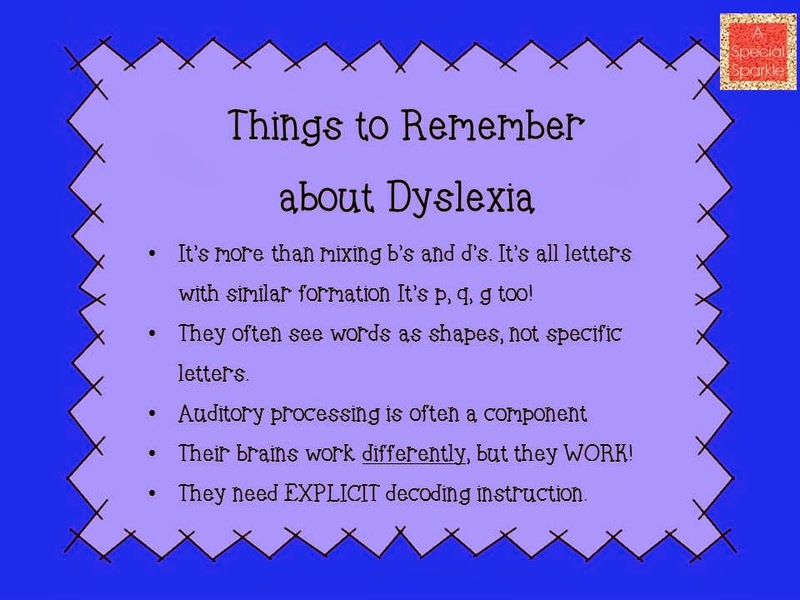 Students with dyslexia need to learn the explicit rules for reading and what causes letters to make different sounds. The English language is very confusing, and students with reading disabilities need to know exactly what causes letters to make so many sounds. Think of it as phonics instruction on steroids! I teach rules such as when to double l, s, f, and z at the end of words. I also teach my kids to scoop sentences into phrases to help them see the pausing and tone within stories. We mark up words to show their spelling patterns such as closed syllables and vowel-consonant-e. Three of the best programs are Wilson FUNdations, Wilson Reading System, and Slingerland. 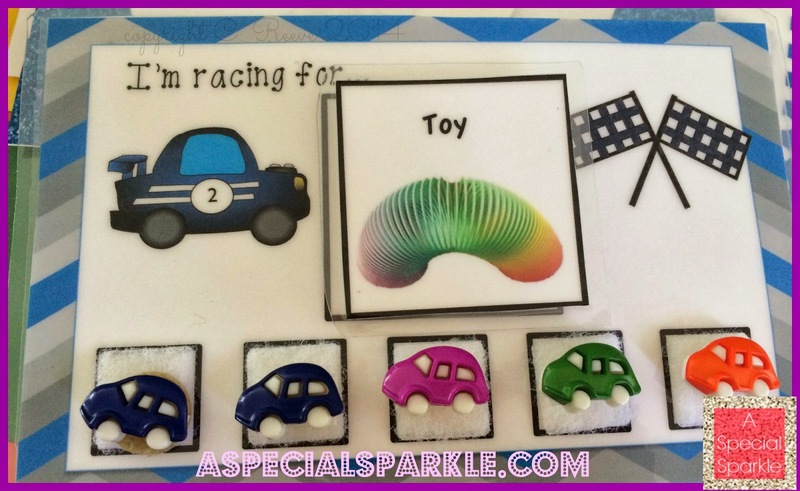 They all teach the rules, letter formation, and use multi-sensory strategies for reading instruction. The best thing for a kid with dyslexia is to KNOW they have dyslexia. I know due to confidentiality this isn't always possible, but you can always tell a kid they learn differently. You can also make them very aware of their struggles and teach them strategies to overcome them. My kids all know they switch up their letters and I always cue kids to "check your letters!" or "check your b's and d's!!" during assignments and tests. This visual from Come Together Kids is by far my favorite!! 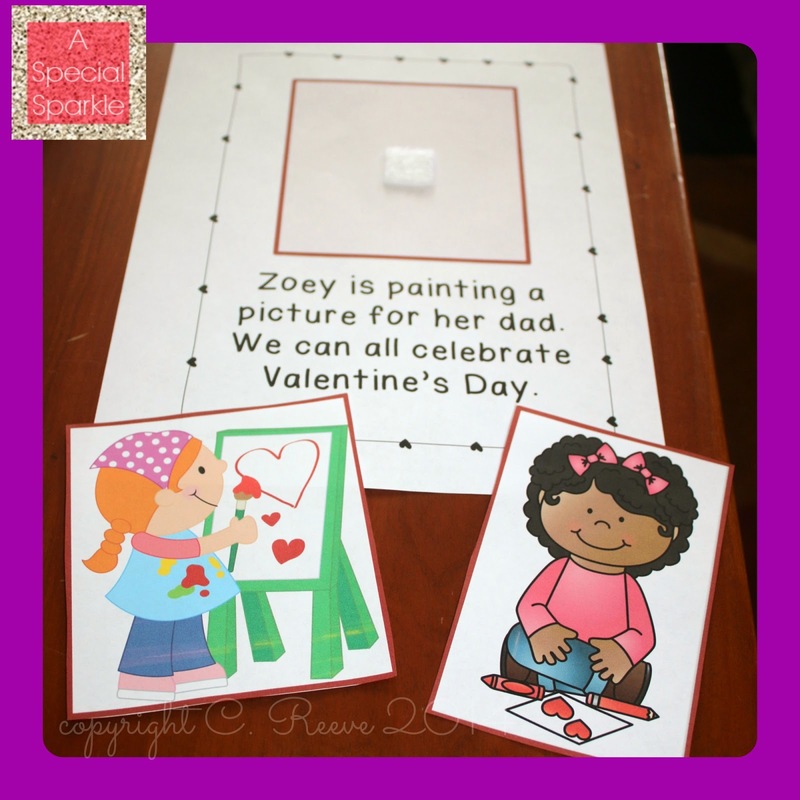 The best thing is the kids can use it anywhere because they always have their hands, and they may not always have a letter chart. The kids use their fists to make a "bed" and a "pig" in the middle of class almost every day. I've also developed this set of number and letter charts to help my kids know the difference between letters that go to the left and those that go toward the right. What Can I do?? Where do I learn more? 1) READ! Overcoming Dyslexia is one of the most highly recommended books about dyslexia and is a must read! 2) Change your font! There was a very smart set of researchers who discovered some fonts are easier to read for kids with dyslexia and he developed a font specifically for people with dyslexia called Dyslexie. I've had 2 adult friends with dyslexia test out the same paragraph with a traditional font versus Dyslexie and they told me there was a noticeable difference! 3) Change the paper! 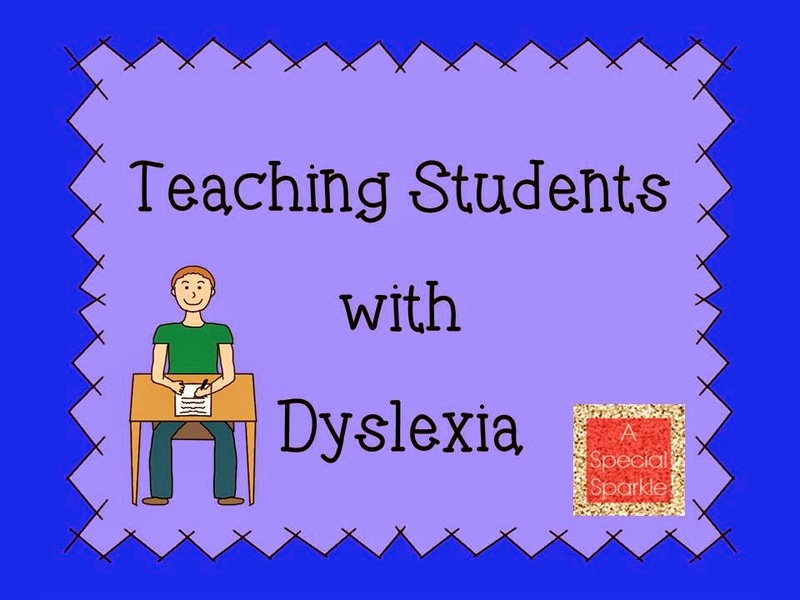 Students with dyslexia often struggle with visual-spacial awareness. Writing on the lines is exceptionally difficult. Brightlines makes paper with both color and raised lines. Students stay in the blue area for lower case letters, plus the lines are raised so they can feel when it's time to stop and not drop below the line. It comes in yellow too. 4) Block out sound! Kids with dyslexia often have auditory processing struggles as well. Blocking out additional sounds can help kids focus during concentration tasks. My students know they can pull out headphones any time, as long as I'm not in the middle of direct instruction. I'm back with another Classroom Carryover Post! Today's subject is vocabulary. Working on Vocabulary is one of the best ways to make a big difference in a student's ability to succeed in a classroom. 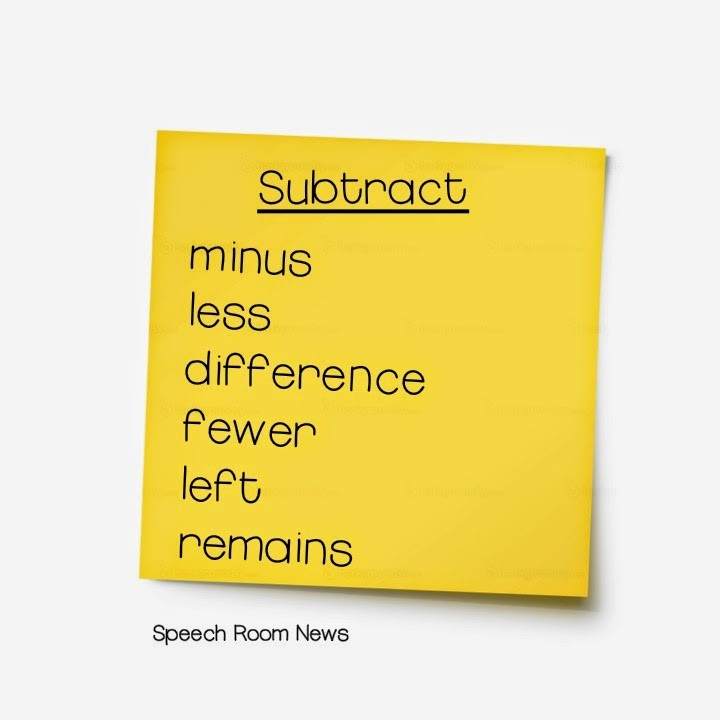 SLPs frequently work directly on vocabulary. 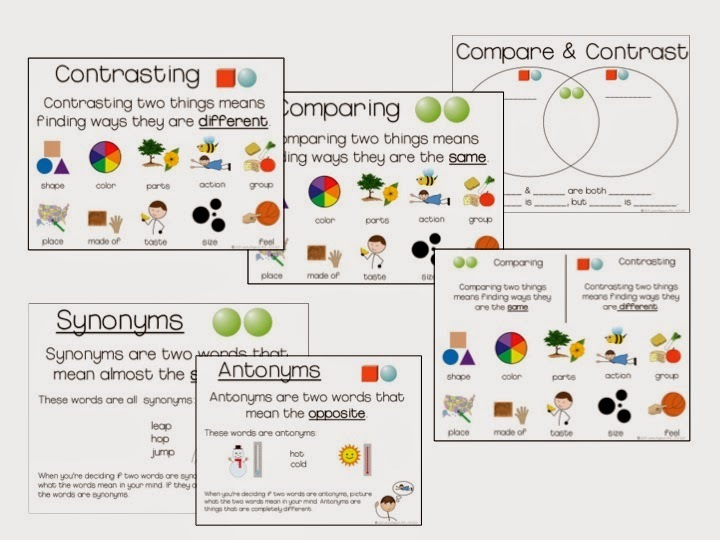 Students with language delays often require direct support for skills such as comparing/contrasting, understanding categories, and synonyms/antonyms. 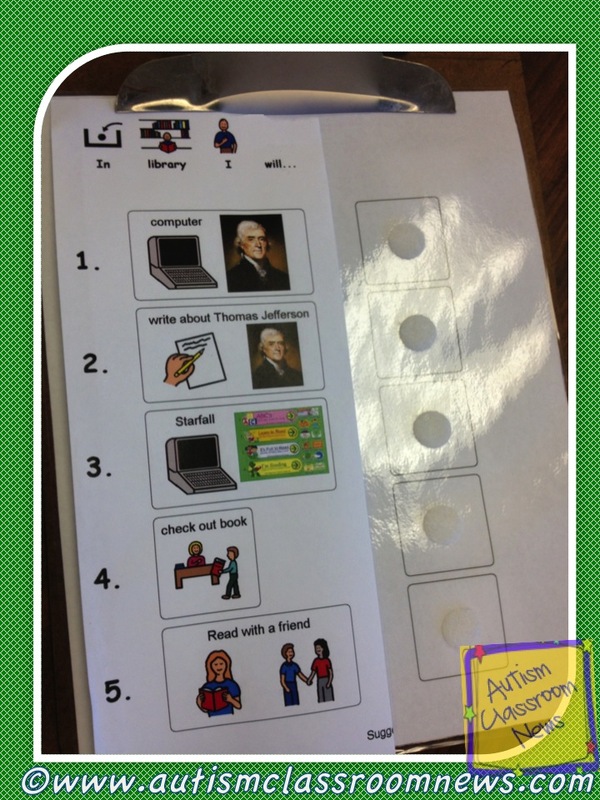 Visual supports are a great way to support students with carryover of this skill. 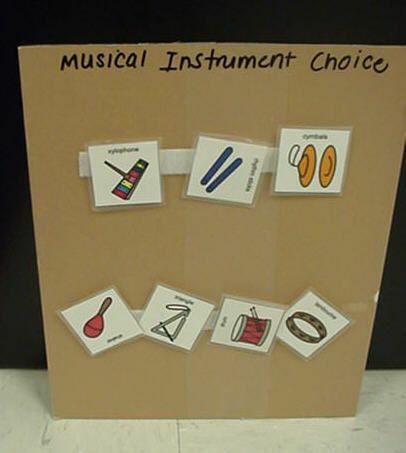 Teachers can display anchor charts or posters throughout their rooms. If you have students working on these skills during speech and language try embedding them into your daily instruction. During calendar time, ask your student to name 3 types of weather they observed today (sun, wind, cloudy, etc.). You can ask your student what the weather is today. It's hot! Great, now name the antonym for hot! I suggest picking a skills and attempting to find 2 opportunities per day to practice. SLPs directly target Tier 2 vocabulary. Students with language delays might demonstrate more difficulty to identify terms in the directions, word problems, etc. For example, there are many words for math terms like 'addition' and 'subtraction'. 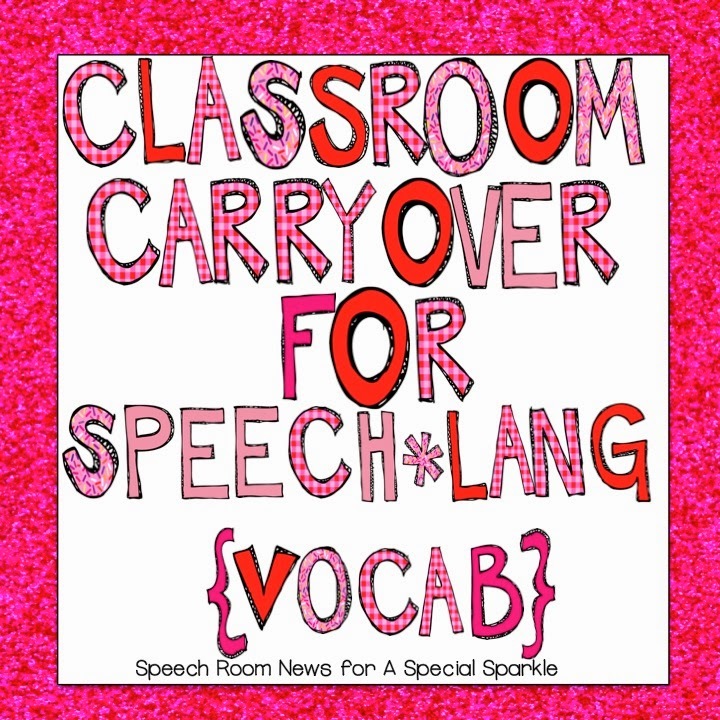 Teachers can support students by providing visuals or a verbal cue. If the class is working on word problems, write a quick list of terms on the board. In a science class, a student might need clarification on words such 'compare' or 'analyze' in directions on a force and motion unit. Review those terms with your student before expecting them to complete the assignment. By providing these accommodations for vocabulary, teachers can ensure the student understand the vocabulary necessary to attempt to question. How do you support vocabulary for your students? A few weeks ago my class started our very own GoNoodle account and we are OBSESSED. We can't get enough of it! 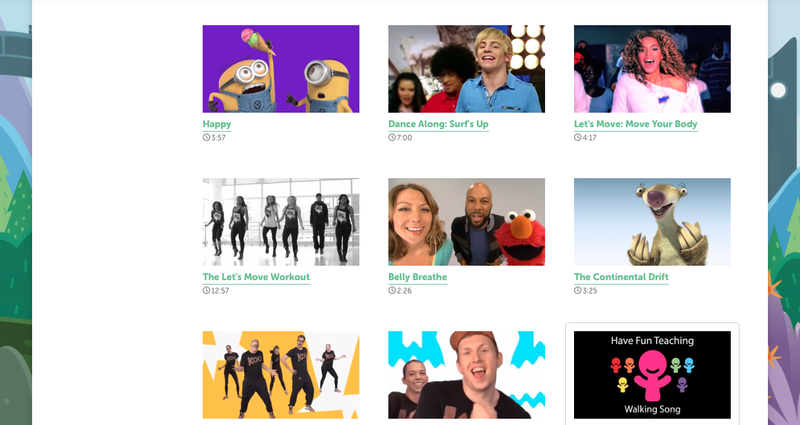 If you're new to GoNoodle, it's a website that is devoted to brain breaks and movement in the classroom. 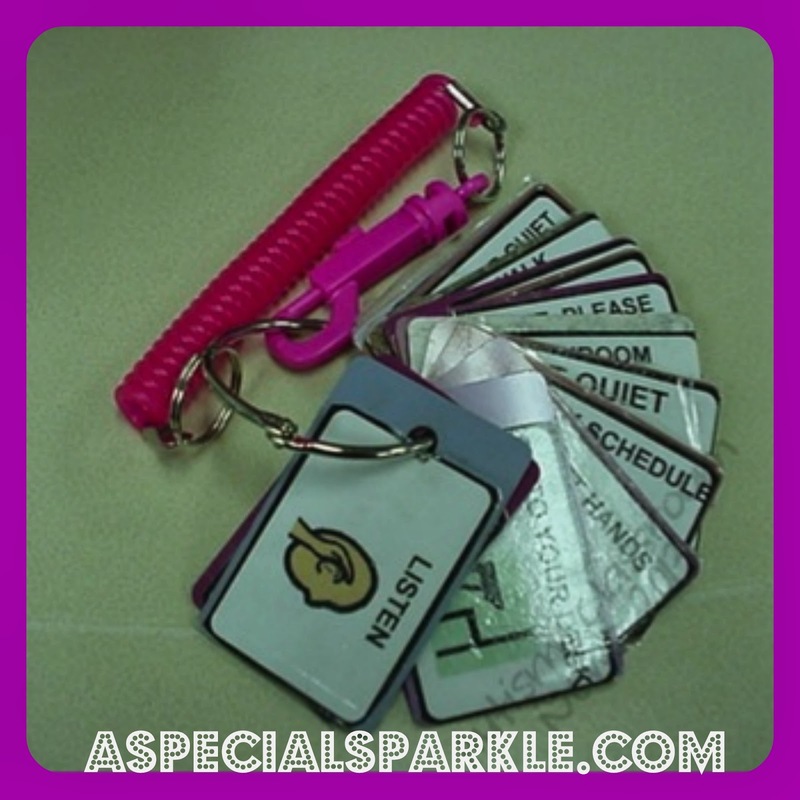 When I first joined, I was uneasy about when it would be okay to use it and how my kids would respond. We all know that sometimes when you turn on music and have the kids move around, you may be making the craziness worse. That is not the case with GoNoodle. When you start an account you pick a mascot that will represent your class. As you choose exercises and complete minutes, you move on to new levels and your mascot gets bigger. The kids can't wait to see if we beat another level and they love watching McPufferson grow! It only takes 15 minutes to move on to a new level. When you reach the next level, the background changes too. Before we started, I told them there were some rules that we had to follow. Everyone has to participate or it won't work (teacher secrets hehe). You have to stand behind your chair. I was amazed that my kinder-firsts really follow along with the Zumba dances, the yoga poses and the different movements involved. It is a great way to get up out of our seats and have a brain break! 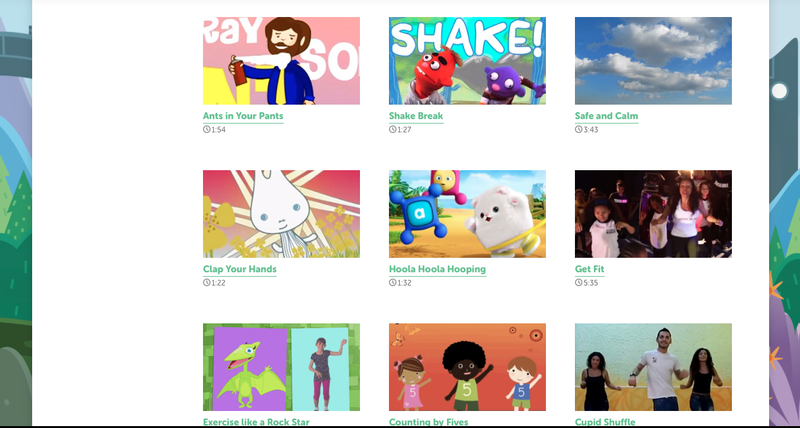 There are a variety of videos on it so you can choose what best fits your class. Before we go to lunch every day, we have a "free dance" to the Happy song from Despicable Me 2, but before we start centers we do yoga to get us ready to focus. 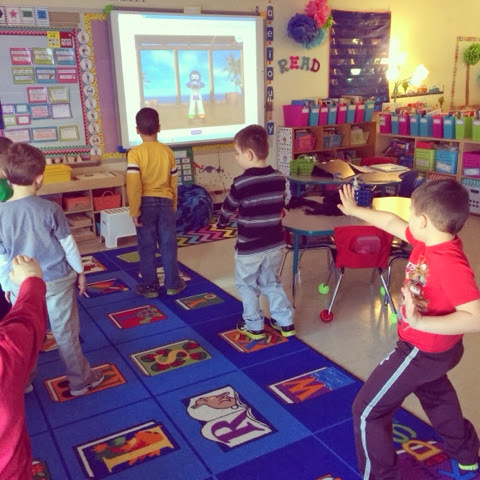 At this time of year when we are all in desperate need of movement, GoNoodle is a total must. Last week a teacher at my school emailed everyone to apologize that her class may have sounded "rowdy" because they were trying to beat a level! I love it. 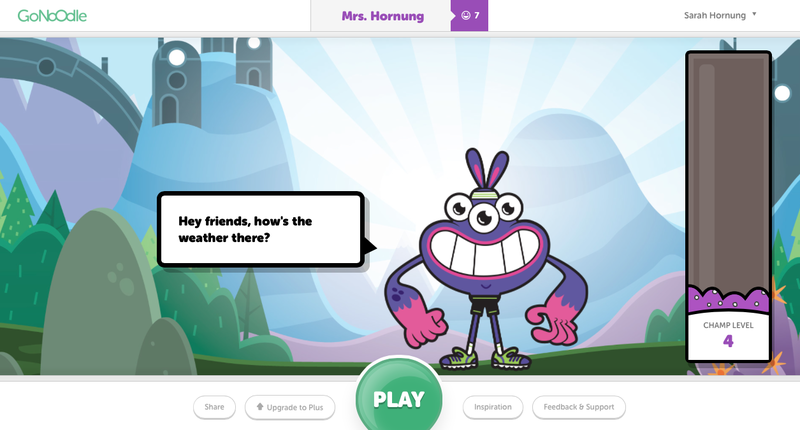 GoNoodle will even send you a class pack of stickers with your mascots face on them! How fun is that? Here are a few of the great breaks available! Go now and GoNoodle! 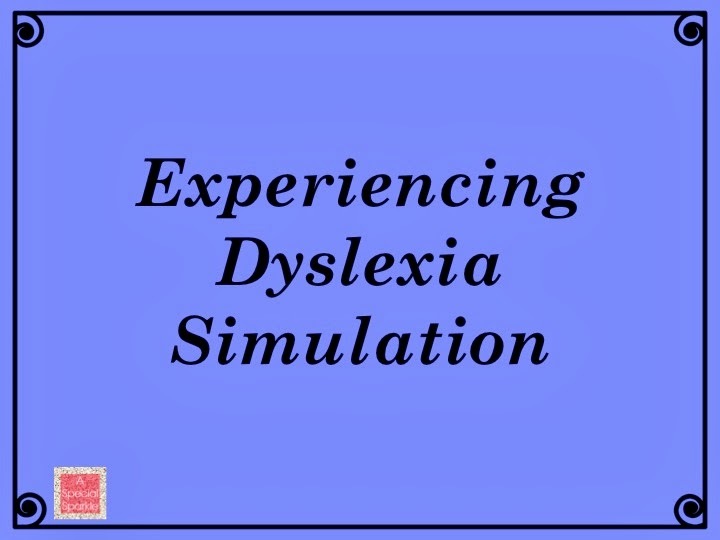 This week I had the opportunity to experience, then facilitate a very realistic and impacting simulation about what it feels like to have dyslexia. It was beyond anything I ever thought it could be! By the end of the simulation several parents were close to tears as they discovered just how hard school was for their child with dyslexia. NOTE: I have in NO WAY been asked to promote this product. These are my genuine opinions with no prompting from the company to promote them. The Northern California Branch of the International Dyslexia Association has developed a dramatically realistic representation of what it is like to experience dyslexia with standard academic tasks that you'd see in any classroom. This simulation is one they do each year as a form of parent education and this year I was asked to be a part of it. Before the parents came, we were each given an activity that we had to read/prepare and were expected to facilitate the parents as they went through the simulation. Then before the parents came for the seminar, all of us had the opportunity to experience all 6 simulation activities. Boy was it an eye opener!! Obviously as a special education teacher I understand each of these struggles my students face, but it's quite different to sense them myself. Even as teachers, there were certain activities where people just gave up. They felt like they just couldn't do it. It's an emotional, frustrating, and eye opening experience. There were 6 activities: 2 writing, 2 reading, and 2 listening. I wish I could pick a favorite, but they were all eye opening in their own special way. My station was called "Write or Left" and required participants to write with their opposite hand to demonstrate the difficulties with writing and copying. Some parents got very distraught trying to complete the tasks. Some showed task avoidance, some cheated, and some were on the verge of tears. I also observed some very interesting things! One woman was shockingly good at the task and I complemented her. She told me that she's naturally left-handed, but in school teachers forced her to become right-handed so she's now proficient in both. It's such a wild idea in modern times to assume you can force a natural phenomenon to change. However, I do know that this was common practice many years ago. I also had 2 young girls (sisters) come with their parents. I believe they were in 3rd and 4th grade. When the dad and one of the girls came to my table I watched them both closely because clearly they brought their daughters for a purpose, not just to avoid getting a baby-sitter. One task was to copy a gibberish cursive-like doodle from memory on to the back of the paper. I saw the little girl trace it, then stare straight forward and trace it in the air without looking as she memorized the shape of the "word." I told her I was impressed and that it was the most creative and effective strategy I'd seen all night. She told me that she has dyslexia and it's the way she practices her spelling/vocabulary cards. The dad's reaction was almost hard to watch. To see the look on his face as he realized just how hard everyday school tasks for his daughter... it was a combination of revelation and tears. Another mother could hardly speak when I asked her follow up questions about what it felt like. She said she finally understood why her son does so many things he does, and why he's getting in trouble for things when he gives up and gets off task. She noted she now understands when he doesn't care when he doesn't finish an assignment, because he feels like he can never finish any assignment on time. One mother said she'd been to every seminar possible about learning differences and dyslexia and that this was unlike any other! She was begging for us to hold another one so she could bring more people to experience it. We just finished our second set of conferences for the year and we'll have one more round before the school year ends. This set of conferences really got me thinking about the importance of a strong connection between home and school. I'd like to present a "case study" so to speak. I want to show you my own success and failure in the world of home and school connections and how they have directly affected the lives of three of my students. I have a co-teacher too, but we tend to divide our kids based on who we connect with the most. Two of these kids are "mine" and one is a kid we share because we love him to death! All three of these kids were considered behavioral concerns when the year started. This student is on the spectrum and in a school that is not specifically focused on spectrum disorders. Many of the teachers love the kid, but few understand him. He has been one of my favorites from the day I met him! Many teacher thought he was being a pain on purpose, when really he was just confused about the world and insanely blunt about his thoughts. He appears so high functioning that it's easy to confuse his disorder for rude/bad behavior. His family and I have a VERY strong connection and have little chats almost every day at pickup or drop off. They often ask questions and confirm that his behaviors at home are what we see at school. They let us know when he's had challenges such as not sleeping the night before a school day. Since the year started, this student progressed from expressing none of his emotions or there causes at school to expressing himself all the time... perhaps even a little too much some days. Through my connection with his parents, I was able to learn and pass along the information that he likes to write to me when he's upset instead of talking to me. He has since done this at home all the time now! This kid couldn't even spell when he entered our class and he has created the motivation to learn so that he can't write down his thoughts and feelings to us. He has also started using phrases like "I feel ___ because ____." Yes, sometimes his feelings are slightly irrational, but now we know what caused them and can then provide reasonable explanations to him for social situations he doesn't understand. This has significantly reduced his crying and outbursts. He also has learned to preface things with "I'm not trying be rude, but I don't understand why ____." His parents and I have worked hard at explaining what things are deemed rude and he now knows how to ask in a way where we know he doesn't understand a situation and really wants to know about something but knows it may come across as a rude question or "talking back." He is making huge academic and social strides every day and is a happier child because of it! This student has a learning difference and is very hyperactive. He is very socially smart and well beyond his years in many ways. He is one of the most popular and funny children in the room. In class we have set firm boundaries for him and strict consequences to limit silliness and other behaviors. We've also implemented more interventions than I can count for both his academic and sensory needs. Off the top of my head I can think of 5 different accommodations on/in his desk that we encourage him to use in addition to several brain/movement breaks. He knows the boundaries and expectations at school and is fully capable of following them successfully. Our home/school connection has been inconsistent. We've made a strong effort and sent home countless update emails. We have had chats at pickup and drop off but they aren't always well received. If the student has a bad day the lead parent finds ways to excuse the behavior. This has since translated into the child making endless excuses for his behavior. He is so smart that he works the events into stories that sound completely rational, although often an inaccurate description of the actual events. The parents often believe the child over the teachers which has caused a huge disconnect between home and school. The family is often mad at events that "happened" at school when they aren't entirely accurate. It has been a struggle to make behavioral and academic progress with this student because his behavioral expectations are so different between home and school. The parents expectations for his behavior are far different and they do not set the same limits that we expect the child to follow at school. We find we spend more time defending our actions than working as a team with the family to find ways to IMPROVE the child's behavior. 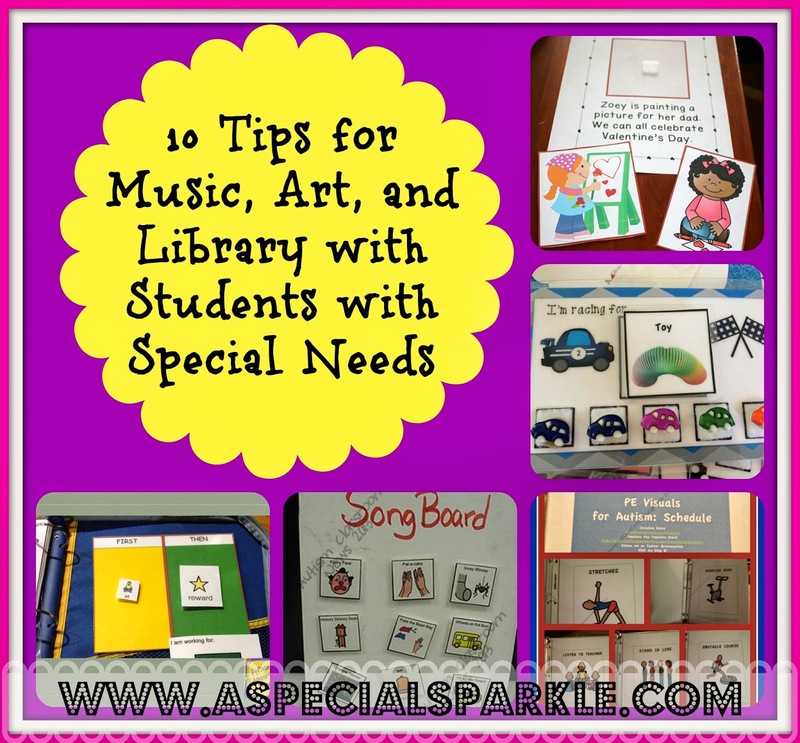 It has been a struggle to show them that despite his disability, he is fully capable of being a great kid with great behavior which will greatly improve his academics. He has made wonderful progress in many ways since the beginning of the year, but not nearly as much as we know he is capable of. This child was by far the most challenging student in his class last year. There were debates about if he would last in our school because of his emotional outbursts. We set firm limits with appropriate rewards and consequences in our classroom for all of our students along with a corresponding behavior chart. This child THRIVES on our system. We have successfully eliminated major outbursts at school and greatly reduced minor outbursts which are now few and far between. We have the strongest home and school connection imaginable with the family! They are totally on board with our strategies and terminology we use at school. We work closely with their home behaviorist and we are always in the loop for they way things are progressing at home. We keep a firm and predictable set of standards for behavior at home and school. We are constantly emailing the family with both positive and challenging behaviors we see at school and they support us. The same is done in reverse when they have things happen at home. We are a universal front between home and school and this child is like a whole new person from last year. 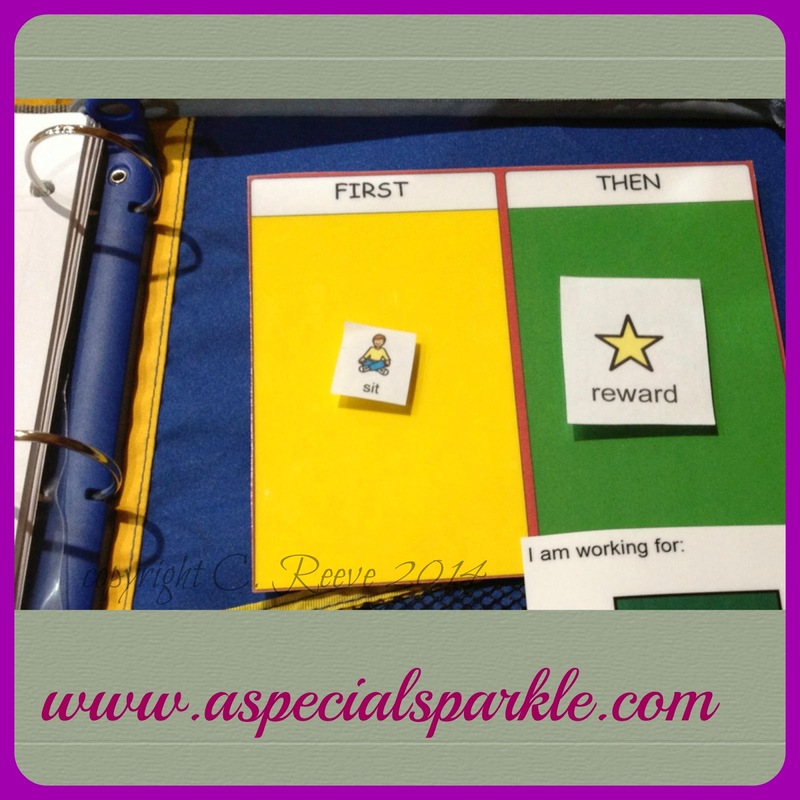 We've had countless specialists and staff members comment on how much this child had changed and improved. This is the epitome of a strong home & school connection and how the system can work when we are a team! 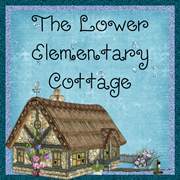 What challenges have you encountered when trying to create a home & school connection? What things have been successful for you?